Combine all ingredients for the vinaigrette and puree until smooth. Set aside. Combine quinoa with the vinaigrette. 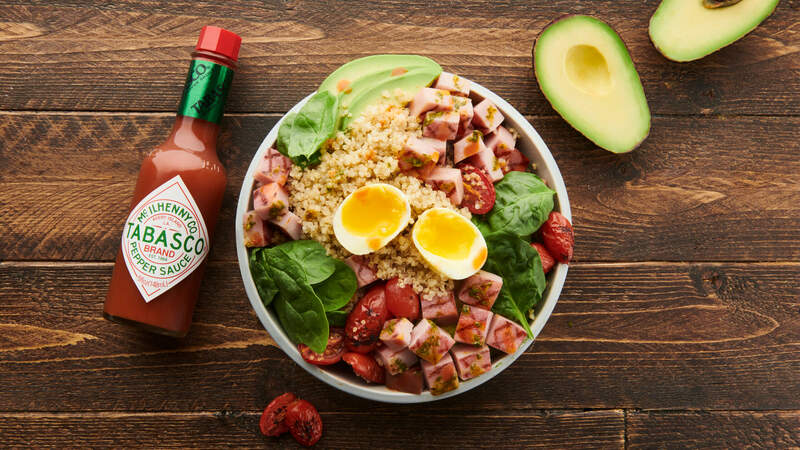 Assemble each bowl by placing 1 cup of the quinoa and vinaigrette on bottom and topping with a ½ cup of the ham, ¼ of the sliced avocado, ¼ cup of the tomatoes and spinach and one poached egg. Serve. Change up your grains and beans for different textures and flavors. Brown rice, lentils, black beans and others work great for this recipe. This can be served with crostini or similar types of toast/breadsticks to enhance the presentation.